Human rights in the Soviet Union were severely limited and for most of its existence the population was mobilized in support of the single State ideology and the policies promoted by the Communist Party. Prior to April 1991 only one political party was permitted in the Union of Soviet Socialist Republics (USSR) and the members of the Communist Party held all key positions, whether in the State itself or in other organizations. Freedom of speech was suppressed and dissent was punished. Independent political activities were not tolerated, whether these involved participation in free labour unions, private corporations, independent churches or opposition political parties. The state's proclaimed adherence to Marxism-Leninism restricted any rights of citizens to private property. The regime maintained itself in political power by means of the secret police, propaganda disseminated through the state-controlled mass media, personality cultism, restriction of free discussion and criticism, the use of mass surveillance, political purges and persecution of specific groups of people. In the new 1977 Constitution the Party was, for the first time, openly and formally declared the leading force in the country. According to Universal Declaration of Human Rights, human rights are the "basic rights and freedoms to which all humans are entitled. ", including the right to life and liberty, freedom of expression, and equality before the law; and social, cultural and economic rights, including the right to participate in culture, the right to food, the right to work, and the right to education. The Soviet conception of human rights was very different from conceptions prevalent in the West. According to the Soviet legal theory, "it is the government who is the beneficiary of human rights which are to be asserted against the individual", whereas Western law claimed the opposite. The Soviet state was considered as the source of human rights. Therefore, the Soviet legal system regarded law as an arm of politics and courts as agencies of the government. Extensive extra-judiciary powers were given to the Soviet secret police agencies. The regime abolished Western rule of law, civil liberties, protection of law and guarantees of property which were considered as examples of "bourgeois morality" by the Soviet law theorists such as Andrey Vyshinsky. According to Vladimir Lenin, the purpose of socialist courts was "not to eliminate terror ... but to substantiate it and legitimize in principle". Historian Robert Conquest described the Soviet electoral system as "a set of institutions run by the peasants and workers for the peasants and workers: a model constitution adopted in a worst period of terror and guaranteeing human rights, elections in which there was only one candidate, and in which 99 percent voted; a parliament at which no hand was ever raised in opposition or abstention." Sergei Kovalev recalled "the famous article 125 of Constitution which enumerated all main citizen and political rights" in Soviet Union. But when he and other prisoners attempted to use this as a legal base for their abuse complaints, their prosecutor's argument was that "the Constitution was written not for you, but for American Negros, so that they know how happy lives Soviet citizens have". Crime was determined not as the infraction of law, but as any action which could threaten the Soviet state and society. For example, a desire to make a profit could be interpreted as a counter-revolutionary activity punishable by death. The liquidation and deportation of millions of peasants in 1928–31 was carried out within the terms of Soviet Civil Code. Some Soviet legal scholars even asserted that "criminal repression" may be applied in the absence of guilt.". Martin Latsis, chief of the Ukrainian Cheka explained: "Do not look in the file of incriminating evidence to see whether or not the accused rose up against the Soviets with arms or words. Ask him instead to which class he belongs, what is his background, his education, his profession. These are the questions that will determine the fate of the accused. That is the meaning and essence of the Red Terror." The purpose of public trials was "not to demonstrate the existence or absence of a crime – that was predetermined by the appropriate party authorities – but to provide yet another forum for political agitation and propaganda for the instruction of the citizenry (see Moscow Trials for example). Defense lawyers, who had to be party members, were required to take their client's guilt for granted..."
In the 1930s and 1940s, political repression was practiced by the Soviet secret police services, OGPU and NKVD. An extensive network of civilian informants – either volunteers, or those forcibly recruited – was used to collect intelligence for the government and report cases of suspected dissent. Soviet political repression was a de facto and de jure system of persecution and prosecution of people who were or perceived to be enemies of the Soviet system. Its theoretical basis was the theory of Marxism concerning class struggle. The terms "repression", "terror", and other strong words were official working terms, since the dictatorship of the proletariat was supposed to suppress the resistance of other social classes, which Marxism considered antagonistic to the class of the proletariat. The legal basis of the repression was formalized into Article 58 in the code of the RSFSR and similar articles for other Soviet republics. Aggravation of class struggle under socialism was proclaimed during the Stalinist terror. Censorship in the Soviet Union was pervasive and strictly enforced. This gave rise to Samizdat, a clandestine copying and distribution of government-suppressed literature. Art, literature, education, and science were placed under strict ideological scrutiny, since they were supposed to serve the interests of the victorious proletariat. Socialist realism is an example of such teleologically-oriented art that promoted socialism and communism. All humanities and social sciences were tested for strict accordance with historical materialism. All natural sciences were to be founded on the philosophical base of dialectical materialism. Many scientific disciplines, such as genetics, cybernetics, and comparative linguistics, were suppressed in the Soviet Union during some periods, condemned as "bourgeois pseudoscience". At one point Lysenkoism, which many consider a pseudoscience, was favored in agriculture and biology. In the 1930s and 1940s, many prominent scientists were declared to be "wreckers" or enemies of the people and imprisoned. Some scientists worked as prisoners in "Sharashkas" (research and development laboratories within the Gulag labor camp system). Every large enterprise and institution of the Soviet Union had a First Department that reported to the KGB; the First Department was responsible for secrecy and political security in the workplace. According to the Soviet Criminal Code, agitation or propaganda carried on for the purpose of weakening Soviet authority, or circulating materials or literature that defamed the Soviet State and social system were punishable by imprisonment for a term of 2–5 years; for a second offense, punishable for a term of 3–10 years. According to communist ideologists, the Soviet political system was a true democracy, where workers' councils ("soviets") represented the will of the working class. In particular, the Soviet Constitution of 1936 guaranteed direct universal suffrage with the secret ballot. Practice, however, departed from principle. For example, all candidates had been selected by Communist Party organizations before democratization and the March 1989 elections. Personal property was allowed, with certain limitations. Real property mostly belonged to the State. Health, housing, education, and nutrition were guaranteed through the provision of full employment and economic welfare structures implemented in the workplace. However, these guarantees were not always met in practice. For instance, over five million people lacked adequate nutrition and starved to death during the Soviet famine of 1932–1933, one of several Soviet famines. The 1932–33 famine was caused primarily by Soviet-mandated collectivization. Economic protection was also extended to the elderly and the disabled through the payment of pensions and benefits. St. Vladimir's Cathedral in Astrakhan, which served as a bus station in Soviet times. The Soviet Union promoted Marxist-Leninist atheism. Toward that end, the Communist regime confiscated church property, ridiculed religion, harassed believers, and propagated atheism in the schools. Actions toward particular religions, however, were determined by State interests, and most organized religions were never outlawed outright. Some actions against Orthodox priests and believers included torture; being sent to prison camps, labour camps, or mental hospitals; and execution. Many Orthodox (along with peoples of other faiths) were also subjected to psychological punishment or torture and mind control experimentation in an attempt to force them give up their religious convictions (see Punitive psychiatry in the Soviet Union). Practicing Orthodox Christians were restricted from prominent careers and membership in communist organizations (e.g. the party and the Komsomol). Anti-religious propaganda was openly sponsored and encouraged by the government, to which the Church was not given an opportunity to publicly respond. Seminaries were closed down, and the church was restricted from publishing materials. Atheism was propagated through schools, communist organizations, and the media. Organizations such as the Society of the Godless were created. January 10, 1973. Jewish refuseniks demonstrate in front of the Ministry of Internal Affairs for the right to emigrate to Israel. Emigration and any travel abroad were not allowed without an explicit permission from the government. People who were not allowed to leave the country and campaigned for their right to leave in the 1970s were known as "refuseniks". According to the Soviet Criminal Code, a refusal to return from abroad was treason, punishable by imprisonment for a term of 10–15 years, or death with confiscation of property. The passport system in the Soviet Union restricted migration of citizens within the country through the "propiska" (residential permit/registration system) and the use of internal passports. For a long period of Soviet history, peasants did not have internal passports, and could not move into towns without permission. Many former inmates received "wolf tickets" and were only allowed to live a minimum of 101 km away from city borders. Travel to closed cities and to the regions near USSR state borders was strongly restricted. An attempt to illegally escape abroad was punishable by imprisonment for 1–3 years. Human rights activists in the Soviet Union were regularly subjected to harassment, repressions and arrests. In several cases, only the public profile of individual human rights campaigners such as Andrei Sakharov helped prevent a complete shutdown of the movement's activities. 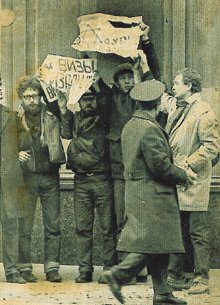 A more organized human rights movement in the USSR grew out of the current of dissent of the late 1960s and 1970s known as "rights defenders (pravozashchitniki). Its most important samizdat publication, the Chronicle of Current Events, circulated its first number in April 1968, after the United Nations declared that it would be the International Year for Human Rights (20 years since Universal Declaration was issued), and continued for the next 15 years until closed down in 1983. A succession of dedicated human rights groups were set up after 1968: the Action Group for the Defense of Human Rights in the USSR went public in May 1969 with an appeal to the UN Human Rights Committee; the Committee on Human Rights in the USSR was established in 1970;  and a Soviet section of Amnesty International appeared in 1973. The groups variously wrote appeals, collected signatures for petitions, and attended trials. The eight member countries of the Warsaw Pact signed the Helsinki Final Act in August 1975. The "third basket" of the Final Act included extensive human rights clauses. :99–100 In the years 1976–77, several "Helsinki Watch Groups" emerged in the USSR, to monitor the Soviet Union's compliance with the Helsinki Final Act. The first group was the Moscow Helsinki Group, followed by groups in Ukraine, Lithuania, Georgia and Armenia. :159–194 They succeeded in unifying different branches of the human rights movement. :159–166 Similar initiatives began in Soviet satellite states, such as Charter 77 in the Czechoslovak Socialist Republic. Over the next two years the Helsinki Groups would be harassed and threatened by the Soviet authorities and eventually forced to close down their activities, as leading activists were arrested, put on trial and imprisoned or pressured into leaving the country. By 1979, all had ceased to function. The period from April 1985 to December 1991 witnessed dramatic change in the USSR. In February 1987 the head of the KGB, Victor Chebrikov reported to Mikhail Gorbachev, first secretary of the Soviet Communist Party, that 288 people were serving sentences for offenses committed under Articles 70, 190-1 and 142 of the RSFSR Criminal Code; a third of those convicted were being held in psychiatric hospitals. Most were released during the course of the year, spurred on by the death in prison of veteran dissident Anatoly Marchenko in December 1986. This was only the tip of the iceberg. Soon ethnic minorities, confessional groups and entire nations were asserting their rights, respectively, to cultural autonomy, freedom of religion and, led by the Baltic states, to national independence. Just as glasnost did not represent "freedom of speech", so attempts by activists to hold their own events and create independent associations and political movements met with disapproval and obstruction from Gorbachev and his Politburo. Early in December 1987 Shevardnadze, Yakovlev and Chebrikov reported on a proposed human rights seminar to be held in Moscow on 10-14 December 1987 with guests from abroad, and suggested ways of undermining, restricting and containing the event organised by former Soviet dissidents. The reaction to a similar proposal seven months later was much the same. As they conceded more and more of the rights over which the Communists had established their monopoly in the 1920s, events and organisations not initiated or overseen by the regime were frowned on and discouraged by the supposedly liberal authorities of the brief and ambivalent period of perestroika and official glasnost. In the remaining two and a half years the rate of change accelerated. The quasi-democratic Congress of People's Deputies held its second autumnal session in 1989 during a nationwide miners' strike. One consequence was the abolition in March 1990 of Article 6 of the Soviet Constitution (1977), which had explicitly established the primacy of the Communist Party within the Soviet State, a hitherto unspoken but all-pervasive dominance of the system. The authorities formed units of riot police OMON to cope with the unprecedented and mounting incidence of protests and rallies across the USSR. In Moscow these culminated in a vast demonstration in January 1991, denouncing the actions of Gorbachev and his administration in Lithuania. ^ Lambelet, Doriane. "The Contradiction Between Soviet and American Human Rights Doctrine: Reconciliation Through Perestroika and Pragmatism." 7 Boston University International Law Journal. 1989. pp. 61–62. ^ Shiman, David (1999). Economic and Social Justice: A Human Rights Perspective. Amnesty International. ISBN 978-0967533407. ^ Richard Pipes (1994) Russia Under the Bolshevik Regime. Vintage. ISBN 0-679-76184-5., pages 401–403. ^ Wyszyński, Andrzej (1949). Teoria dowodów sądowych w prawie radzieckim (PDF). Biblioteka Zrzeszenia Prawników Demokratów. pp. 153, 162. ^ Oleg Pshenichnyi (2015-08-22). "Засчитать поражение". Grani.ru. Retrieved August 23, 2015. ^ Yevgenia Albats and Catherine A. Fitzpatrick. The State Within a State: The KGB and Its Hold on Russia – Past, Present, and Future, 1994. ISBN 0-374-52738-5. ^ a b Feldbrugge, Simons (2002). Human Rights in Russia and Eastern Europe: essays in honor of Ger P. van den Berg. Kluwer Law International. ISBN 978-90-411-1951-3. ^ Davies and Wheatcroft, p. 401. For a review, see "Davies & Weatcroft, 2004" (PDF). Warwick. ^ "Ukrainian Famine". Ibiblio public library and digital archive. Retrieved 2011-04-21. ^ A Study of the Soviet economy, Volume 1. International Monetary Fund, Organization for Economic Co-operation and Development. 1991. ISBN 978-92-64-13468-3. ^ A Country Study: Soviet Union (Former). Chapter 5. Trade Unions. The Library of Congress. Country Studies. 2005. ^ Mary Ann Glendon (2001). A World Made New: Eleanor Roosevelt and the Universal Declaration of Human Rights. New York. ISBN 9780375760464. ^ Thomas, Daniel C. (2005). "Human Rights Ideas, the Demise of Communism, and the End of the Cold War". Journal of Cold War Studies. 7 (2): 110–141. doi:10.1162/1520397053630600. ^ Horvath, Robert (2005). "The rights-defenders". The Legacy of Soviet Dissent: Dissidents, Democratisation and Radical Nationalism in Russia. London; New York: RoutledgeCurzon. pp. 70–129. ISBN 9780203412855. ^ An appeal to the UN Commission on Human Rights", A Chronicle of Current Events (8.10), 30 June 1969. ^ "The Committee for Human Rights in the USSR", A Chronicle of Current Events (17.4), 31 December 1970. ^ a b Thomas, Daniel C. (2001). The Helsinki Effect: International Norms, Human Rights, and the Demise of Communism. Princeton, N.J: Princeton University Press. ISBN 9780691048598. ^ "A new public association", A Chronicle of Current Events (40.13), 12 May 1976. ^ Thomas, Daniel C. (2001). The Helsinki effect: international norms, human rights, and the demise of communism. Princeton, N.J: Princeton University Press. ISBN 978-0691048581. ^ Bukovsky Archive, KGB report to Gorbachev, 1 February 1987 (183-Ch). ^ "Release of a large group of political prisoners", Vesti iz SSSR, 1987 (15 February, 3.1) in Russian. ^ Bukovsky Archive, report by Shevardnadze, Yakovlev and Chebrikov, 4 December 1987 (2451-Ch). ^ Bukovsky Archive, Kryuchkov to Politburo, 27 July 1988 (1541-K). ^ Bukovsky Archive, Moscow Party committee to CPSU Central Committee, 23 January 1991 (Pb 223). Denial of human rights to Jews in the Soviet Union: hearings, Ninety-second Congress, first session. May 17, 1971. U.S. Government Printing Office. 1971. Human rights–Ukraine and the Soviet Union: hearing and markup before the Committee on Foreign Affairs and its Subcommittee on Human Rights and International Organizations, House of Representatives, Ninety-seventh Congress, First Session, on H. Con. Res. 111, H. Res. 152, H. Res. 193, July 28, July 30, and September 17, 1981. U.S. Government Printing Office. 1982. "Human rights: the dissidents v. Moscow". Time. 109 (8): 28. 21 February 1977. Boim, Leon (1976). "Human rights in the USSR". Review of Socialist Law. 2 (1): 173–187. doi:10.1163/157303576X00157. Chalidze, Valeriĭ (1971). Important aspects of human rights in the Soviet Union; a report to the Human Rights Committee. New York: American Jewish Committee. OCLC 317422393. Chalidze, Valery (January 1973). "The right of a convicted citizen to leave his country". Harvard Civil Rights-Civil Liberties Law Review. 8 (1): 1–13. Conquest, Robert (1986) The Harvest of Sorrow: Soviet Collectivization and the Terror-Famine. Oxford University Press. ISBN 0-19-505180-7. Courtois, Stephane; Werth, Nicolas; Panne, Jean-Louis; Paczkowski, Andrzej; Bartosek, Karel; Margolin, Jean-Louis & Kramer, Mark (1999). The Black Book of Communism: Crimes, Terror, Repression. Harvard University Press. ISBN 0-674-07608-7. Daniel, Thomas (2001). The Helsinki effect: international norms, human rights, and the demise of communism. Princeton, N. J.: Princeton University Press. ISBN 9780691048598. Dean, Richard (January–March 1980). "Contacts with the West: the dissidents' view of Western support for the human rights movement in the Soviet Union". Universal Human Rights. 2 (1): 47–65. doi:10.2307/761802. JSTOR 761802. Fryer, Eugene (Spring 1979). "Soviet human rights: law and politics in perspective". Law and Contemporary Problems. 43 (2): 296–307. doi:10.2307/1191202. JSTOR 1191202. Graubert, Judah (October 1972). "Human rights problems in the Soviet Union". Journal of Intergroup Relations. 2 (2): 24–31. Johns, Michael (Fall 1987). "Seventy years of evil: Soviet crimes from Lenin to Gorbachev". Policy Review: 10–23. Khlevniuk, Oleg & Kozlov, Vladimir (2004) The History of the Gulag : From Collectivization to the Great Terror (Annals of Communism Series) Yale University Press. ISBN 0-300-09284-9. Samatan, Marie (1980). Droits de l'homme et répression en URSS: l'appareil et les victimes [Human rights and repression in the USSR: mechanism and victims] (in French). Paris: Seuil. ISBN 978-2020057059. Pipes, Richard (1994) Russia Under the Bolshevik Regime. Vintage. ISBN 0-679-76184-5. Rummel, R.J. (1996) Lethal Politics: Soviet Genocide and Mass Murder Since 1917. Transaction Publishers. ISBN 1-56000-887-3. Szymanski, Albert (1984). Human rights: the USA and the USSR compared. Lawrence Hill & Co. ISBN 978-0882081588. Crimes of Soviet Communists — wide collection of sources and links. Chekists in Cassocks: The Orthodox Church and the KGB – by Keith Armes. G.Yakunin, l.Regelson. Letters from Moscow. Religion and Human Rights in USSR. – Keston College Edition. Love story under the H-bomb shadow – by K.E. Filipchuk and Z.K. Silagadze. This page was last edited on 19 April 2019, at 15:34 (UTC).